The court stated that it's initial decision on 14 June to dissolve the assembly must be enforced and Morsi's decree was in violation of the initial ruling. "The court ruled to halt the president's decision to recall the parliament," judge Maher el-Beheiry said. Earlier, an anticipated confrontation between Egypt's newly elected president and the military seemed to have been deflected after the defunct parliament reconvened for all of five minutes. Morsi, of the Muslim Brotherhood, had issued a decree on Sunday ordering parliament to reconvene, in defiance of the constitutional court's ruling and a subsequent military decree ordering its dissolution. The parliamentary speaker, Saad el-Katatny, convened a session of the lower house on Tuesday morning but it lasted only five minutes, during which time he stressed that parliament had the utmost respect for the law, and would do nothing to subvert it. 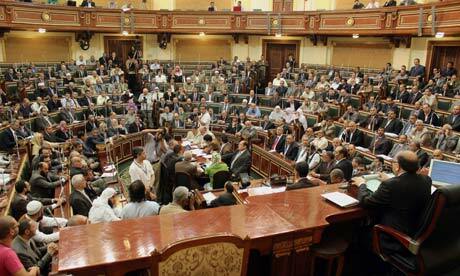 MPs then voted that parliament would refer the matter of its ability to convene to the court of cassation in Cairo, and would not assemble until a judgment had been given. As the drama was being played out, demonstrators against the dissolution of parliament gathered in Tahrir Square. Meanwhile, anti-parliament protesters congregated on the other side of town in the eastern district of Nasr City to voice their objection to its return. Tuesday's assembly was boycotted by a sizable number of liberal MPs while an independent MP, Mustafa Bakri, had already announced his formal resignation from parliament due to its unconstitutionality. Only days before the runoff election last month that saw Morsi claim victory as Egypt's first civilian and post-revolution president, the supreme court had ruled that the manner in which parliament was elected had been unconstitutional. The Supreme Council of the Armed Forces (Scaf) then issued a decree ordering its dissolution, and military vehicles and personnel surrounded the parliament building to prevent MPs from entering. The issue became more contentious when Scaf issued a new constitutional declaration hours after polls had closed, in which it gave itself sweeping powers, including all legislative authority in the absence of parliament. The dissolved parliament contained a Muslim Brotherhood majority through its political arm, the Freedom and Justice party, of which Katatny was a member and which Morsi used to head. Morsi's decree on Sunday had tried to circumvent the legal morass surrounding parliament by directly addressing the Scaf declaration – issued from a legislative position – and not the supreme court ruling. The supreme court judges issued a statement on Monday that their ruling was binding and not subject to appeal. It urged all state authorities not to contravene it. Scaf issued a statement urging Morsi to respect the constitutional findings of the court.